I was recently approached by a dear friend to get my thoughts on what I would deem a state-rights / state sovereignty organization. Having sent a reply, I wanted to further address the issue of state-rights (yes, this was hyphenated at one time), and vocalize my thoughts on the matter here. I know there are a number of state-rights organizations out there, and those generally wishing to limit the scope and power of the federal government. Another that I'm familiar with is the Tenth Amendment Center, whose focus is on nullification. So, would I support these organizations / movements? 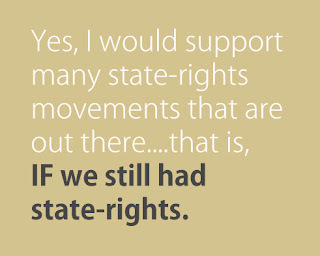 Yes, I would support many state-rights movements that are out there....that is, IF we still had state-rights. Unfortunately, we don't. The 10th Amendment can't be enforced successfully by states today, as they don't have legal standing. I'll try to explain. If you look up the legal definition of "state", it's essentially a specific people or body politic, and their government, collectively. States today were put into place forcibly through various violations of the Constitution. Our states today are federal satellites composed of national U.S. citizens. NATIONAL citizens. Think about it. This means you're a citizen of congress, not of your state. The very idea vehemently opposes the concept of state-rights. This problem MUST be addressed first, before you can go shouting at the federal government. Each of the above cases utilizes the 14th Amendment to apply case law to EVERY state, and its citizens, regardless of what the state itself wants to do. Now, regardless of your opinion on the above topics, this clearly shows the power the 14th amendment has in overruling states, wherever they so deem it necessary. But the problem doesn't end with the 14th amendment. The 14th amendment was required to be passed by states by the Reconstruction Acts. Yes, REQUIRED. These Acts declared certain states as non-existent (North Carolina was one of them); removed voting rights without due process; violated the fifth amendment; and resurrected new states on the same soil, violating Article 4, Section 3. The Acts also enforced a Bill of Attainder (highly unconstitutional), and well.....without listing out every violation, these Acts basically treated the Constitution like a piece of American doo doo. If states today had the same power and standing as states did around the time of the Civil War, things like Obamacare would be an absolute joke. Do you think states back then would have put up with that sort of crap? Not hardly. The federal government at the time had NO authority in the lives of the people of the several states. The United States wasn't one size fits all. It was a collection of sovereign nation states, each with their own set of laws determined by their individual bodies of people. If we want our state-rights back, we first need our states back. Our lawful states, not the federal satellite posers we have today. I'm sorry to inform that your state representative can't do anything about that. Nor can the Republicans. Nor can the president, regardless of who he is. If our lawful states were overthrown, all we can do is re-establish them, populate them, and become state citizens again, having an oath to a state (body of people! ), creating a resistance to the "symptoms" we see today. When the Constitution is violated, it is our job as the people to remedy the FIRST violation, not to pick and choose which violations are most important. 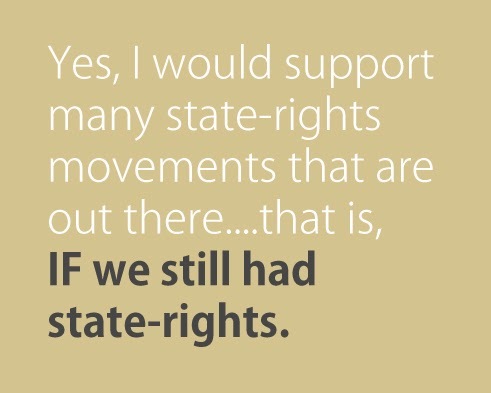 Do I support state-rights? Absolutely I do. But state-rights will only work in a state which has the right to state-rights. So, if your organization promotes this proper order of execution, count me in.